Context: Dysfunctional teams. 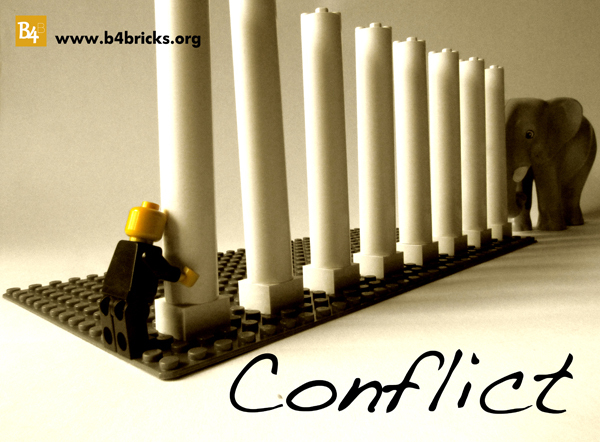 In a longstanding organisation, there are clear ongoing conflicts between individuals or departments. Lots of energy is spent in managing internal balances. Needs: Problems are clear, yet causes are not identified. Origins of conflict need to be identified to manage their solution or removal. Activities: check that the organisation’s mission, strategy and motivation are really shared by all members. Organisations are like living organisms where all parts are called to cooperate effectively to achieve results. However, sometimes some parts of the organism do not seem to be able to collaborate constructively with the other components: this causes tensions and misunderstandings that are reflected in organisations processes, which become clumsy, inconsistent and ineffective. To solve tensions, the focus should be on people and not on problems, on processes rather than on actions. In a LEGO® SERIOUS PLAY™ based workshop, participants have the opportunity to interact and dialogue, share and think keeping the focus on participants’ experiences and visions, so that everyone’s positions are clarified enhancing conflicts resolutions. A LEGO® SERIOUS PLAY™ based workshop is designed so that tensions and conflicts can emerge and can be discussed starting from individual differences. Negotiation enacts a constructive process where shared values are collectively build and discussed, so that tensions can emerge and the group can construct a new start. In the LEGO-model based interaction, tensions and conflicts are discussed avoiding direct personal interaction: the models and the processes enacted by a LEGO® SERIOUS PLAY™ based workshop moves the attention from the individuals to the stories and the metaphors, so that the interaction is productive and constructive, focusing on the problems rather than on personal conflicts. Organisational processes are made up by people, for this reason, we need to put people in the centre of the processes. Managers, tam leaders, project leaders and all those facing major problems linked to difficult relationships between individuals. This entry was posted on May 4, 2013, 2:24 pm and is filed under Uncategorized. You can follow any responses to this entry through RSS 2.0. Responses are currently closed, but you can trackback from your own site.